Consumers have long relied on advice and recommendations from others before making purchasing decisions, and Americans today have access to a vast library of customer ratings and reviews that they can consult when deciding if products or services are worth their money. This survey finds that a substantial majority of the public now incorporates these customer ratings and reviews into their decision-making processes when buying something new: Fully 82% of U.S. adults say they at least sometimes read online customer ratings or reviews before purchasing items for the first time, including 40% who say they always or almost always do so. Reading online reviews is common across wide range of demographic groups, but those under 50 are especially likely to regularly incorporate them into their shopping experiences. 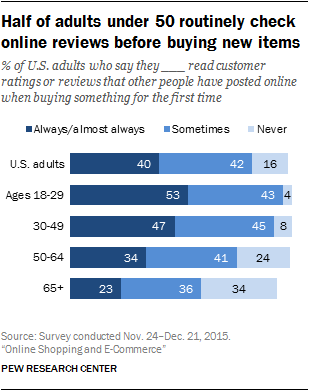 A little more than half (53%) of 18- to 29-year-olds and 47% of 30- to 49-year-olds say they always or almost always read online reviews when buying something for the first time. Fewer adults ages 50-64 (34%) or 65 and older (23%) consistently engage in this type of online shopping behavior. The frequency with which people read online reviews is also correlated with how often they shop online. Roughly two-thirds (67%) of weekly online shoppers say they nearly always read customer reviews before buying new items, compared with 54% of monthly online shoppers and 38% of those who say they shop online less often. Overall, online shoppers are eight times more likely than those who never shop online to say they typically check online reviews before buying something for the first time (49% vs. 6%). In addition to reading online reviews, many Americans watch online videos to help them with purchasing decisions: 55% of U.S. adults say they have watched product review videos online. Product review videos are also more common among those under 50 than among those 50 and older (68% vs. 41%) and more common among men than among women (62% vs. 50%). The trustworthiness of online reviews has come into question in recent years, as business owners and consumers alike have voiced concerns about the validity and truthfulness of the information posted on various online review sites. And when asked about this issue, Americans themselves are nearly evenly split. Roughly half (51%) of those who read online reviews say they generally give an accurate picture of the true quality of the product, but a similar share (48%) believes it is often hard to tell if online reviews are truthful and unbiased. In general, users with greater experience utilizing online reviews are more comfortable with their accuracy and truthfulness. 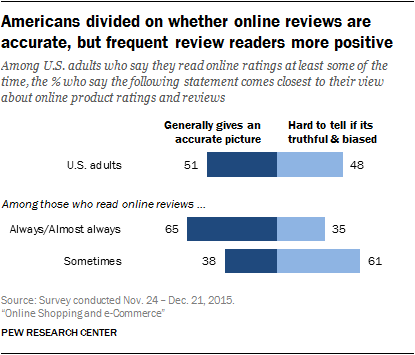 Around two-thirds (65%) of U.S. adults who say they always or almost always read online ratings and reviews believe that they are generally accurate – although even among this group a substantial minority (35%) says it can be hard to determine their truthfulness. But among those who say they only sometimes read online reviews, these figures are reversed: 38% say that online ratings and reviews are generally accurate, while 61% say it’s often hard to tell if they are truthful and unbiased. 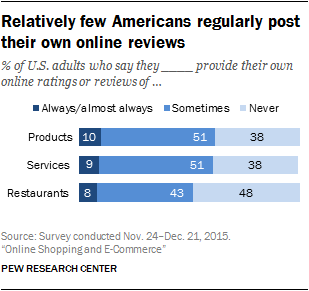 Similarly, Americans under the age of 50 are more likely than older adults to trust the accuracy of online reviews. Some 55% of those ages 18 to 49 who read online reviews feel that they are generally accurate, compared with 45% of those 50 and older. Some 40% of Americans nearly always rely on online reviews when making purchasing decisions – but a much smaller share consistently write their own reviews of the products and services they themselves engage with. The survey asked respondents how often (if at all) they post their own online reviews of three different types of purchases: products they have bought, restaurants they have visited and services they have used. Around one-in-ten Americans nearly always post their own reviews about each of these items, while roughly half sometimes post their own reviews about products and services (a slightly smaller share – 43% – sometimes post their own reviews about the restaurants they visit). There are only modest age differences when it comes to reviewing restaurants or other services, but Americans under the age of 50 are quite a bit more likely than older adults to leave their own product reviews. Fully 71% of 18- to 49-year-olds at least sometimes provide their own reviews of the products they purchase, compared with 49% of those ages 50 and older. Along with dedicated online review sites, social media platforms now provide an opportunity for consumers to share their thoughts and experiences about the products and services they use. And this survey finds that 39% of U.S. adults say they have shared their experiences or feelings about companies or products on social media sites like Facebook or Twitter. Some 55% of 18- to 29-year-olds have engaged in this behavior, as have half (50%) of those ages 30 to 49. Those who have shared their customer experiences on social media report doing so for a mix of both positive and negative reasons. Among those who have talked about their experiences with a company or product on social media, 86% indicate that they have done so after a good experience, while 77% say that they have done so following a bad experience. Issues pertaining to product safety and consumer protection have long been the domain of a number of federal, state and local government agencies. At the same time, Americans now have access to a host of reviews and ratings that might help them learn more about companies and products as well as navigate their way through good and bad consumer experiences. This survey asked Americans to assess the extent to which both of these approaches – government regulations versus reviews and ratings – do a good job of ensuring product safety, encouraging consumer confidence and making companies accountable. On two of these issues in particular, Americans exhibit notably higher levels of trust in ratings and reviews rather than government regulations: A larger share feels that customer ratings and reviews help consumers feel confident about their purchases and a larger share feels that ratings and reviews make companies accountable to their customers. Some 46% of Americans feel that the availability of customer ratings and reviews helps “a lot” to make consumers feel confident about their purchases, nearly double the share (25%) who feels that government regulations help a lot in this regard. Similarly, 45% of the public says that consumer reviews help “a lot” to make companies accountable to their consumers, 15 percentage points higher than the share who feels that government regulations are equally helpful (30%). 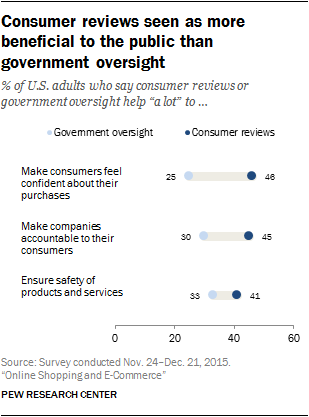 This pattern extends to views about product safety as well, though the differences are narrower: 41% of Americans feel that access to consumer reviews helps “a lot” with ensuring the safety of products and services, slightly higher than the 33% who feel that government oversight helps a lot in this regard.